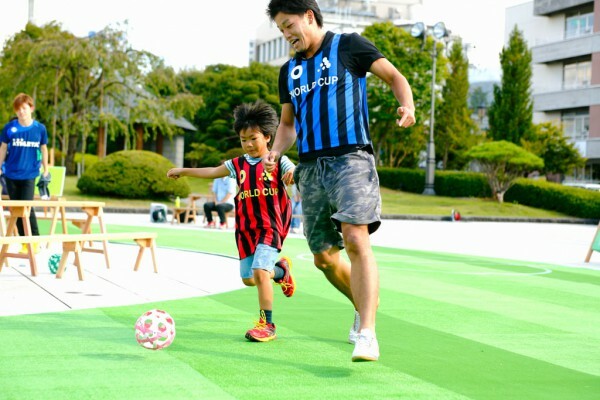 Using sport as an outlet for communication art, we presented a new type of soccer field during the 1st Yamagata Biennale held by the Tohoku University of Art & Design, where artists and authors come together regardless of their discipline. Recognizing that the lines drawn on a diagram can greatly affect people's actions, we sought to create a new space that would foster communication by slightly reconfiguring the familiar white lines found on a soccer field through this experiment between "sports and architecture." 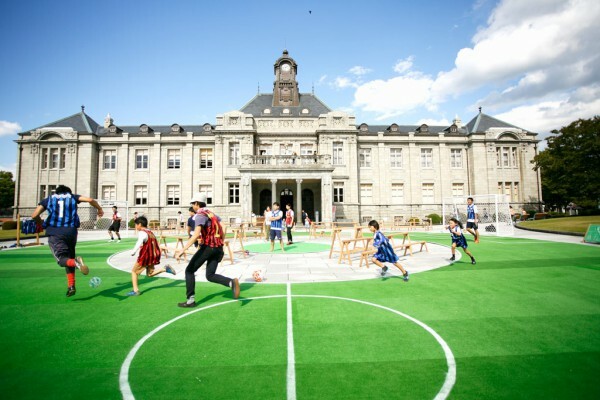 Thus, we designed a donut-shaped soccer field in the garden facing the Bunshokan; a building which once served as a Prefectural Government Building of Yamagata that has been designated an Important National Cultural Asset. 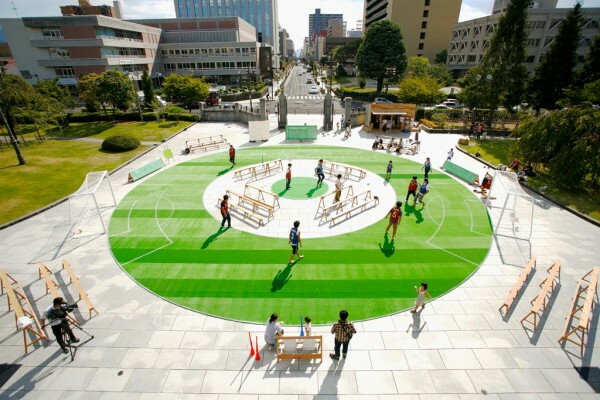 This design enables a new type of playing whereby teams face-off while travelling around the field in either clockwise or counter-clockwise direction. 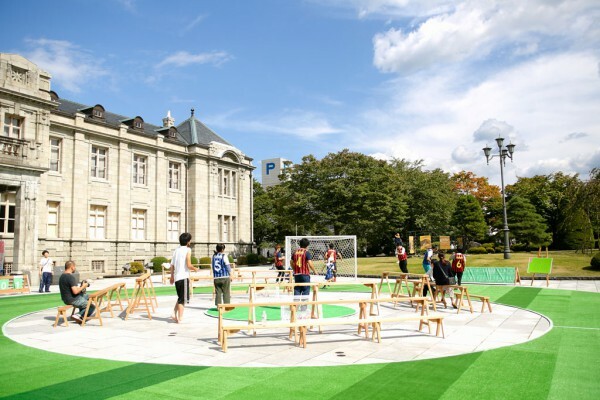 The installation is completed by three-tiered rows of simple stands by Ishinomaki Laboratory placed within the inner and outer areas of the donut-shaped field. 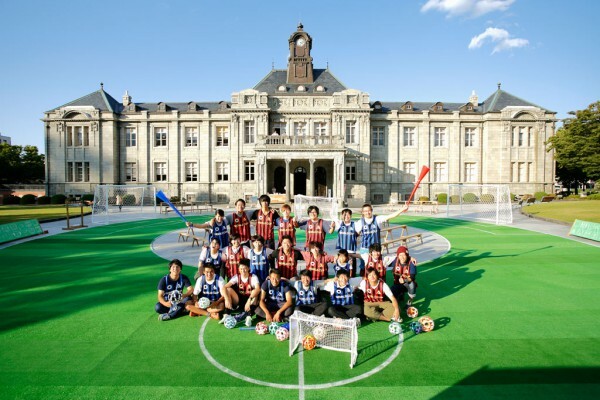 While the new field and the original soccer balls made with colorful stripes of paper level the playing field between beginner and experienced players, original bibs resembling professional uniforms and advertisement billboards like those seen during televised matches contribute to heighten the realism of the competition. 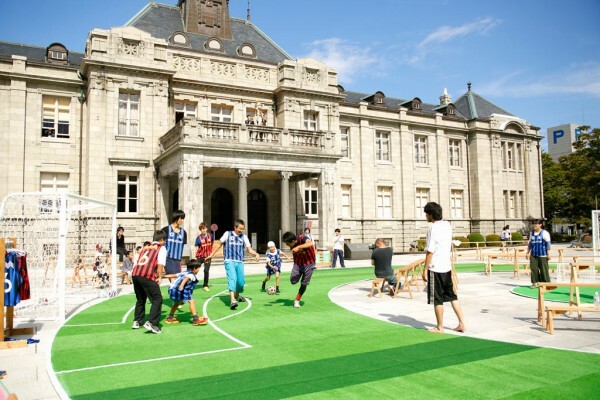 By reimagining the sport field, we sought to boost the unlimited playability of the game.